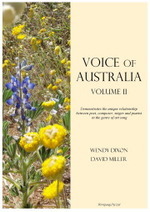 Voice of Australia : Volume II / compiled by Wendy Dixon and David Miller. The rose of Amherst : song cycle for medium voice and piano on poems of Emily Dickinson / Gerald Glynn. This work consists of settings of 6 poems by the great American poetess Emily Dickinson (1830-1886) for medium voice and piano. Emily Dickinson lived almost all her life in the small town of Amherst, Mass. Only a handful of her 1775 short poems were published during her lifetime. She gave them no titles, and used only the dash as punctuation. I have used the numbering employed in the Complete Poems edited by Thomas Johnson, published by Faber & Faber, London. I gratefully acknowledge the permission granted by Harvard University Press to use the poems. Contents note: I'm nobody, who are you? -- Exultation -- The soul selects -- I sing to use the waiting -- Pain -- A summer's day. 28 Oct 2015: at Gerald Glynn Perspective (Recital Hall West, Sydney Conservatorium of Music). Featuring Wendy Dixon, David Miller. 1 Sep 91: Eugene Goossens Hall, ABC Ultimo Centre, Sydney. Featuring Elizabeth Campbell, Anthony Fogg.